Throughout life, we’re told we need to have patience. It’s a virtue, after all. Write romance novel after romance novel, without any promise of being published or paid. But be patient as you have to write a lot to get better, and it takes a large back list before (read if) you can quit your day job. Commit to social media to increase your presence, but be patient as you have to invest a lot of time before you see any rewards. Commit to blogging to connect with other writers and potential readers, but be patient because it takes a long to time to be “found”. If anyone had told me any of the above about “breaking into” my day job, I’d have laughed at them so hard I’d have had to wipe away the tears as I changed majors. One thing I’ve learned about virtues from raising my own children is that they are not the natural state of human beings. They are something sought after, something you aspire to achieve. 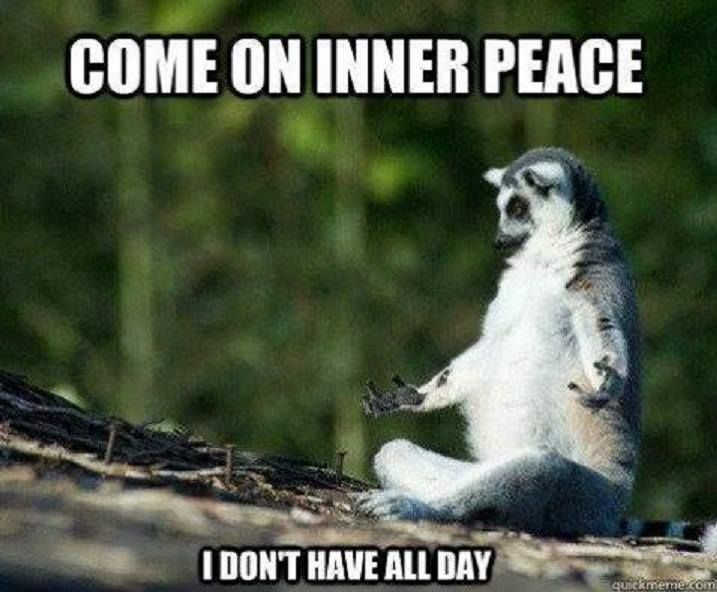 The amount of self-help articles out there professing to teach patience is impressive. But one thing I’ve learned is that the more articles there are to learn how to do something, the harder that something is and the less likely those articles are to help. Google “how to tie a shoe” versus “how to lose weight” and you’ll see what I mean. 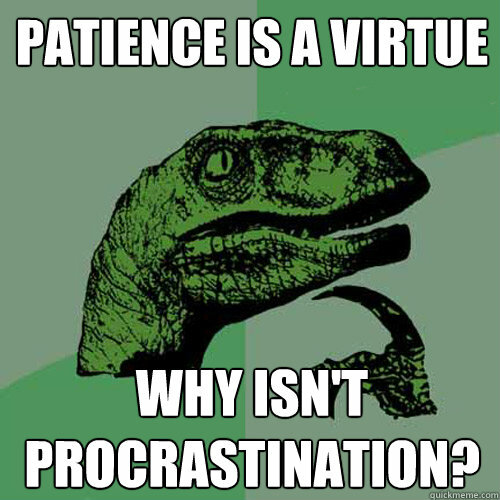 So, why is patience so hard? I think I’ve actually said this. Patience is putting off something you want right now for the promise of a bigger reward later. Think of your dog. He doesn’t care if you promise him three treats tomorrow if he doesn’t eat the one balanced on his nose right now. He’s going to eat the one on his nose as soon as you turn your back. You see this across animal behavior, and as this study shows, humans aren’t that far off from our canine friends. So, I turned to science to understand more. Our instinct is to seize the reward now, and resisting our instincts is hard. Check out any infant or toddler. We believe survival favored those that took immediate rewards. It wasn’t like there was a grocery store a mile away that we could stop at after work and get a tub of triple chocolate ice cream whenever we wanted. You took what came your way when it did. If you’ve been taught throughout life that waiting gets you better things, you might learn to wait. But if you’ve been taught that people aren’t going to follow through, that you can’t trust them, then you’re more likely to grab for the sure thing. All those stories about “living like you’re dying”? They are a case study in lack of patience because you’re uncertain how much of a future you have. The younger you are, the less patience you seem to have. Toddlers and impulse control, anyone? But life teaches us (most of us, anyway) to control those impulses. The more life experience you have, the more patient you become. Until you’re facing your own mortality, and then you’re back to point two above. Ever stay up way too late knowing you were going to regret it in the morning? Being impatient has a similar root cause. The inability to connect your current self to your future self. The more you can visualize your future self either suffering (after staying up too late) or enjoying a large reward (after exhibiting patience), the more likely you are to choose the path that benefits your future self. You know how time flies when you’re having fun, but put you in a corporate tax class, and minutes seem like hours? This has actually been proven by science. What this means is you have to be even more patient to get something you’re waiting for as time will seem to go even slower than if you weren’t waiting. As I look through this list, the only thing that really seems within my control is working to visualize my future self. To know that if I keep working at my writing now, that future self will be happier. I can apply this to things other than writing. Like parenting. Losing my patience with my children gives me a momentary outlet for my frustration, but my future self pays for it with more intractable children and a damaged relationship. Not that I should give into them, but losing my patience is not the right choice. How about you? Are you patient? Impatient? If you’re naturally impatient, anything you do to try make yourself more patient? Does it work? I’m patient but struggle with it. I love that there’s science to back it up, and yes visualising the expected outcome helps.